Before we go further, let's go through the accessories that are in the box. As with other dash cams, Thinkware includes everything you need to set it up in your car and start recording right away. There's a long power cable, with plugs into a 12V socket, clips to attach it along the edges of the windshield, a windshield mount for the F800 Pro, spare adhesive tape, and, on top of all this, there is also a microSD card included. Mine came with 16GB of memory. If your PC or laptop does not support microSD cards, you can use the SD or USB adaptors included in the box. The F800 Pro is super easy to install, as you would expect. Based on my experience, the best place to install it is behind your rear-view mirror, where it's out of sight. That location is also great for getting the best view out. Before removing the tape from the adhesive mount, I recommend powering up the F800 Pro and hooking it up to your smartphone first. With the app, you can use the viewfinder to align it just right with the edges of the hood and see whether there's anything blocking the view out through the windshield. The cable that comes in the box is long enough so that you can route it nicely underneath the dashboard. If you only have a single 12V socket in the front and need to charge a smartphone or another device while driving, picking up a multiport charger is a good idea. The F800 Pro is a set it and forget type of affair. It's designed so that it gets our of your way, as it starts recording automatically when plugged in. If you need to make changes to the settings, you will have to use the mobile app. Once you have everything set up just right, there's no need to tinker with it. It's fairly compact too, though not the smallest camera in Thinkware's lineup, and it holds up very well over time. Since I've received it, I've had zero issues. The mount is great as well, sticking nicely to the windshield months after installing it. The F800 Pro can also be used with a 24V socket, in case you are wondering. The adapter in the box will make the switch automatically, which is a nice touch. There are a couple of really useful features on the F800 Pro. For instance, it comes with a built-in GPS, so you can see where you've been and, like mentioned in the beginning of this article, track down your car when you need to. This also lets you have the actual speed of your vehicle embedded in the video. That's something that can be turned off if you want. The same goes for the voice recording functionality. It can come in handy at times, but I prefer to have it off in the majority of the time. The good news is that it can be easily toggled on and off using a dedicated button on the F800 Pro. The dash cam also lets you easily format the microSD card on the go. Whether you will want to take advantage of that or not is a different matter, but it's nice to know that you can do that easily, without going through the app. Out of the box, it starts recording automatically, but Thinkware also lets you start manual recordings, which are saved in a different folder and do not get automatically deleted when the microSD card in the F800 Pro runs out of space. The F800 Pro comes with a 2.13MP sensor, which enables 1080p video recording. The sensor is made by Sony (it's an Exmor R IMX291) and, based on what I've seen, it's on par, if not a little better, than the one that's in the older F800. To see what the quality is like, I've uploaded a couple of videos to YouTube. Unfortunately, most of the recent footage has been lost, so you're looking at some of the first content that I recorded with the F800 Pro. 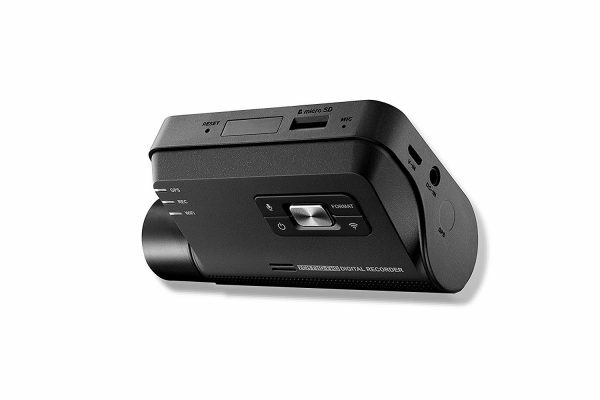 The F800 Pro is the best dash cam that Thinkware has to offer, offering a solid build, solid accessory selection, and lots of useful features. It's also among the more expensive options on the market, being available for just under $380 on Amazon.